This "Historically Speaking" column appeared in the Exeter News-Letter on Friday, March 28, 2014. Fads and entertainments come and go, usually leaving no trace. In the 1880s, the United States was gripped with a fervor for roller skating and the excitement even reached Exeter. Roller skating was particularly popular in New England, perhaps because our long frigid winters encouraged ice skating. But what were Exeter’s skaters to do when there was no ice? The first recorded roller skater was a Belgian inventor named John-Joseph Merlin, who strapped on a pair of in-line skates of his own making to wear to a masquerade in 1760. The crude skates were awkward and didn’t allow easy turning. Merlin was reported to have fallen and crashed more often than he remained upright. The idea of strapping wheels onto ones’ feet continued to intrigue inventors for another hundred years until James Plimpton of New York created a four-wheeled skate (aptly named the ‘quad skate’) in 1863 that allowed the wearer to gracefully turn just by shifting one’s weight. Plimpton, more than anyone else, is given credit for popularizing roller skating as a recreational sport. After forming the New York Roller Skating Association, he and his club rented the Atlantic House in Newport, Rhode Island, in 1866, converting the dining room into the first public roller rink in the United States. Improvements in the roller skate continued and more rinks popped up, particularly in the larger cities of New England. Exeter’s roller rink, the Park Roller Skating Rink, opened on November 15th, 1883, on Lincoln Street near the B&M depot. The building was massive – fifty feet wide and one hundred feet long – and carefully constructed to accommodate over one hundred skaters. The Exeter News-Letter described it, “the whole space forming a large room that is without any obstruction. The roof is trussed and braced in such a manner as to obviate the necessity for posts or pillars, and the disposition of the spectators at the side and end of the room permits the largest economy of space.” Skates could be rented at the front door for ten cents, or if one was not willing to try skating, you could still pay the twenty-five cent admission fee to sit in the gallery and enjoy the show. And watching was entertainment enough. Often artistic skaters were brought in to put on a show. 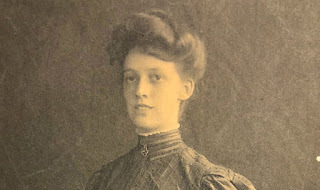 On opening day the News-Letter reported, “At about eight o’clock the floor was cleared and Miss Sylvester and Prof. B.L. Bailey, of Boston, gave an exhibition of plain and fancy skating. The grace and precision of many of the most difficult movements and the ease with which they were executed were the delight of the spectators and the envy of the amateurs, who were now arranged along the left of the room eagerly watching every step, and frequently bursting into hearty applause at some especially intricate or beautiful figure.” Professor Bailey was noted to be using “Mt Desert” skates, which were described as, “Evidently strong, well made skates, or they would never have stood the strain to which they were subjected.” Roller skates, at that time, would have been very rough to modern eyes. Mt. Desert skates had solid wooden soles that attached to ones’ shoes with leather traces. The wheels were also wood and had no ball bearings to smooth out the ride. Yet, though the skating rink had a wildly popular opening, within four years it was gone. The skating rink changed hands several times and was even updated with electric lights, but it still wasn’t enough. Perhaps it was because roller skating fell out of popularity. Or perhaps it was simply overshadowed by a newer fad – bicycling, which allowed couples more freedom away from the public eye. In any event, the Park Roller Skating Rink disappeared from Exeter’s landscape in 1887. Instead of being repurposed into some other type of business right where it stood, the rink was moved to a new location and began a second career at Hedding Camp Ground in Epping. The Methodist Church had run camp meetings at Hedding since the 1860s, and by 1887 had determined that they needed a large meeting hall. Somehow, and we don’t know exactly how, the entire building was moved to Epping. Most likely, it was disassembled and reassembled on site, but there is no record of the move. At the Hedding Campground it was renamed “Chautauqua Hall” and has been in constant use ever since the move. More people have known it at Hedding than ever knew it as the Park Roller Skating Rink in Exeter. 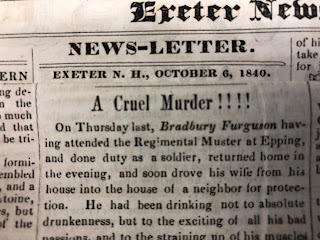 Its brief time in Exeter is hard to document – it existed in a sliver of time when no maps were made of the town and no directories listed businesses. There are no photos (or at least we have found none) of the building when it was in Exeter. Roller skating surged back to life many times in the following years. There was roller skating at Exeter’s Town Hall at times, and briefly another rink near the railroad tracks, but never again with the fanfare of the opening of the Park Roller Rink in 1883. 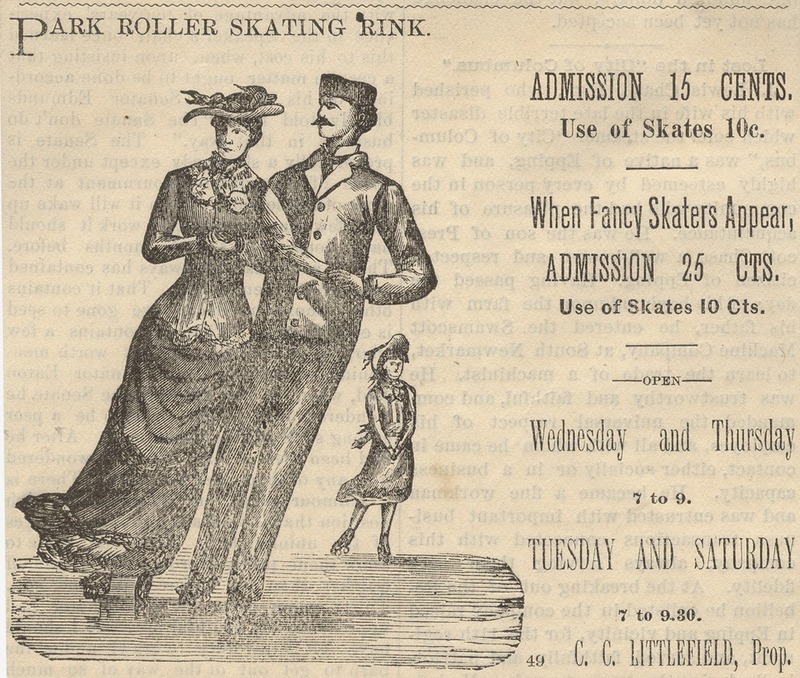 Image: Advertisement from the January 25th, 1884 edition of the Exeter News-Letter for the Park Roller Skating Rink.